In a large bowl, combine the yeast with the warm water and mix well. Let mixture proof for 5 minutes, or until bubbly. Add 2 Tb olive oil to the yeast mixture. In a medium bowl, sift together the flour and salt. Gradually stir in the flour mixture into the yeast mixture, 1 cup at a time, until a soft dough forms. Knead the dough for a few minutes on a floured surface until it is smooth and springy. Shape into a ball and place in a large bowl coated with 1 Tb olive oil. Turn the dough ball to fully over in the oil. Cover the bowl with plastic wrap or a flour sack cloth and let rise in warm place until doubled in size, about 1- 1.5 hours. Gently push the dough down and divide into two equal pieces. Lightly oil two 10-inch round pans or a large baking sheet with the remaining 1 Tb olive oil. Place each dough half in the round pans or free form by hand in the shape of an oblong and place on the baking sheet. Cover with a flour sack cloth and allow to rise for 30 minutes. Uncover and make deep indents across the entire top of the dough. Cover again and let rise until doubled. While dough is rising, sauté sliced leeks in 1 Tb olive oil in a large pan over medium-low heat, until just tender, about 10 minutes. Season with salt and white pepper to taste, remove from heat and set aside. Preheat oven to 400F degrees. Place breads in the preheated oven and bake for 20 minutes. Remove the breads from the oven and divide the leek mixture onto the breads. Place back in the oven for another 5 minutes, or until the breads are lightly browned. 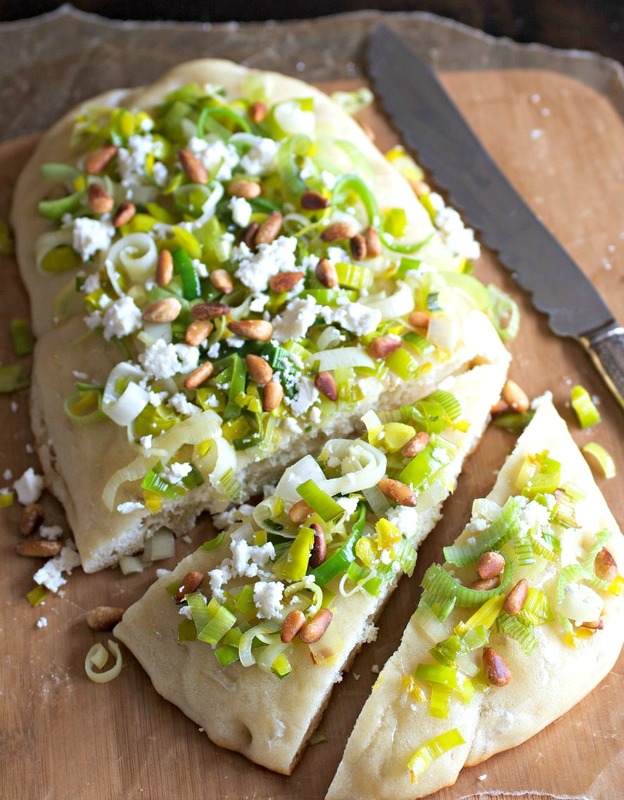 Top breads with the feta cheese and pine nuts. Slice and serve warm or at room temperature. 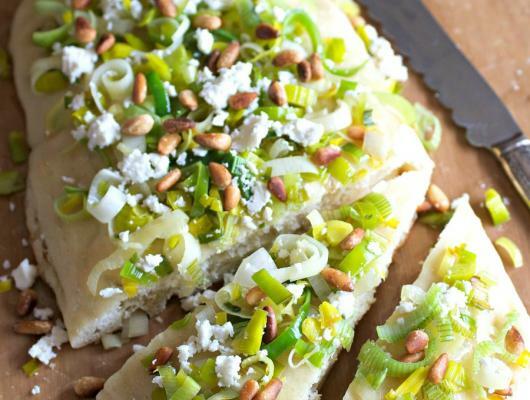 An easy and delicious bread topped with sweet leeks, salty feta cheese, and tasty pine nuts. A wonderful addition to this year’s holiday brunch, lunch or dinner.